Louise at Glossophilia describes the Cambridge comma. It is an April Fool’s Day joke, 1 April being the day when people in Britain and some other countries play practical jokes, and newspapers and blogs join in. I spent the afternoon writing a complicated blog post, translating a publicity brochure for Megacomputers plc, and preparing material for tomorrow’s classes. Sadly, however, nonsense like this pervades the internet. It is an affront to common sense to suggest that there is any ambiguity in the sentences that omit the Oxford comma and, as is always the case, intonation makes the meaning perfectly clear (either way if you insist) in speech. I had toast and orange juice, and eggs. 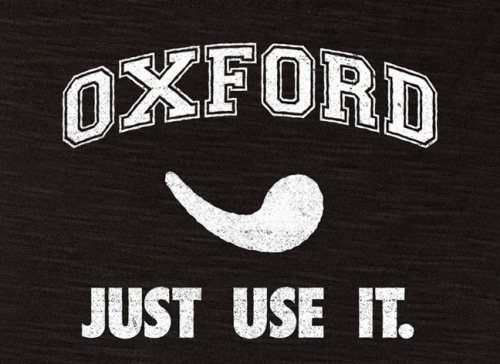 Either way, however, the comma must be considered as an Oxford comma, coming as it does before the last list item. I have already discussed the Oxford comma here. Unlike many people I am not dogmatic about it. As a Cambridge man myself I have an interest to declare, but it seems to me that this is a remarkably useful way of indicating in print both the emphasis that the and has when it is spoken as a way of introducing a surprising element at the end of a list and also the pause that follows it. Commas are used to guide a reader in understanding a text; they are rarely necessary or incorrect grammatically though they are conventionally used to mark parentheses, non-defining relative clauses for example, in conditional sentences when the if clause (protasis) precedes the consequence (apodosis), in other cases where a subordinate clause preceding the main clause, and in lists. The tendency in English seems to be to minimise punctuation; Spanish, on the other hand, is heavily punctuated in comparison. In particular, it is very common in Spanish to find a comma between subject and verb. Though this is not approved of, it follows the common Spanish system of using commas for rhetorical purposes, representing pauses in speech. Long live the splendid Cambridge comma! I look forward eagerly to seeing the University Press adopt it formally as part of Cambridge University’s continuing quest for wisdom, intelligence, research and, novelty.